After Black Friday is over, holiday shoppers are encouraged to support locally owned stores on what’s known as Small Business Saturday, a day that celebrates and supports all that small businesses contribute to their communities. Did you know that buying solar from a SunPower Master Dealer also supports a small business? Our solar installers live and work in local communities nationwide and are proud residents of urban and rural areas alike. Master Dealers are not only experts in the craft of bringing clean energy to homes and businesses, but they’re now improving the solar buying experience for consumers. 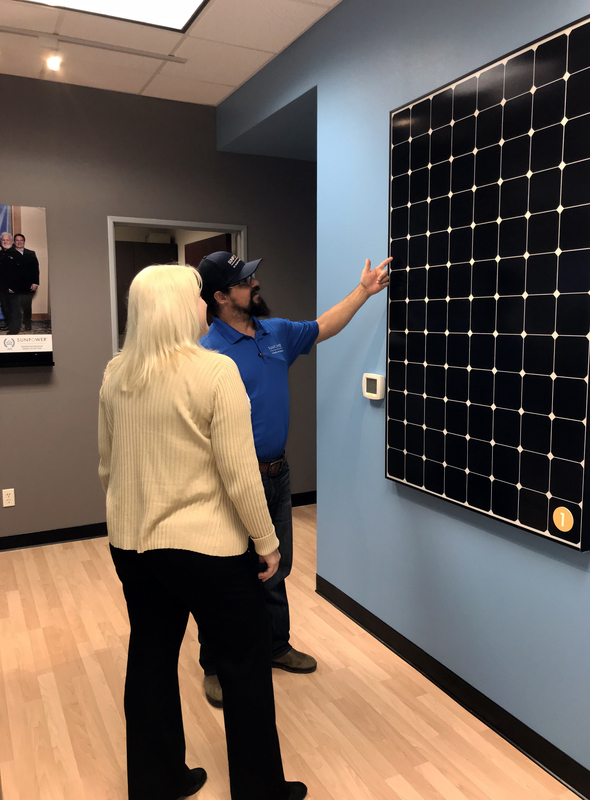 While many homeowners look for solar panel information online, for those preferring a face-to-face experience, a number of our dealers are opening SunPower® Solar Design Centers, brick-and-mortar retail stores where homeowners interested in renewable energy can learn about solar, straight from the professionals. In this Q&A, SunPower by Quality Home Services in Fresno, CA, shares why they opened a local Solar Design Center. Q: What is a Solar Design Center and how does it make buying SunPower solar an easier experience when shopping for home solar? A: A SunPower Solar Design Center is a neutral, relaxing and warm environment where our professional team of consultants can discuss and demonstrate the concept of solar. The design center provides a hands-on and full-featured experience, from how solar energy is produced, installed and designed to how the system production is monitored. The center is designed to enable an energy consultant to customize unique and individual solutions for your home. When visiting a solar design center, there is no need to open your home up for a consultation, since we have everything we need to provide a positive and personalized experience in an inviting and educational setting. When an individual allows us the opportunity to meet in our working environment, they can see first-hand how established our business is, from the front lobby to the warehouse. They can also meet and see the people who are working behind the scenes every day to provide a seamless and positive experience. Q: Tell us a little bit about SunPower by Quality Home Services. A: SunPower by Quality Home Services is a second-generation, family-owned company that has been helping homeowners in the Central Valley of California to have a better quality of life for more than 32 years. We offer high-performance residential solar energy solutions and have installed more than 7 megawatts of residential solar; providing families substantial savings on electricity and delivering a superior customer experience. We have a full service and support department that handles your installation from beginning to end. Choosing a company that has a proven track record of providing a seamless installation experience and excellent customer service over the years provides complete peace of mind. Q: While most folks think of Small Business Saturday as a day to buy holiday gifts from locally-owned merchants, they might not know your solar company is locally owned, too. A: Buying from a local company such as SunPower by QHS, which has a proven history of excellent customer service and customer support, you have the benefit of knowing that the company will be there if ever needed. Shopping local provides benefits to the local economy. Buying local supports the community, providing jobs for those who live here and driving economic development by keeping money flowing in the community rather than being spent elsewhere. Q: What’s your favorite part about meeting clients at the Solar Design Center? What should people expect when they visit? A: Consumers can expect the ability to visualize how solar works, and to see why SunPower panels are more efficient than other panels on the market. A hands-on demonstration of the panels, inverter, roof types, mounting and monitoring systems will provide a full overview of what solar energy production to power your home will mean to you and your family. An energy consultant will evaluate your energy usage and design a system(s), sharing with you customized solutions to lowering your energy costs. Q: Anything else folks should know about their local Solar Design Center? A: The design center is a great place for hosting a group or events. People can also attend a lunch-and-learn and become more familiar with solar energy production. We are always open to discussing how our solar design center provides a great focal point for an introduction to solar. Modena — SunPower by New York Solar Farm Inc.
Don’t see your location listed? Just check our zip code locator for a full list of SunPower solar installers or give us a call at 1-800-786-7693. Thinking about going solar? Visit our solar savings calculator to find out how much you can save.